Syracuse Chamber of Commerce Ambassadors Theresa Cangemi of Medicare Made Simple, Joanna Ferguson of Wells Fargo Advisors, and Suzanne Kondra-DeFuria of Potter Heating/Perrone Plumbing, presented a certificate of congratulations to Cammi Clark, Editor-In-Chief and John Badoud, President of Scotsman Media Group, for their launch of the new Today’s CNY Woman magazine. 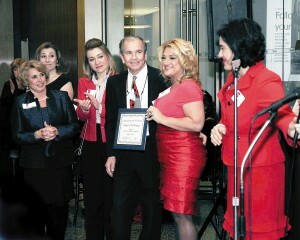 The gala was held at Axa Towers, January 2011. Helping others is more than just my business; it is also something that reaches into all aspects of my life. As a member of this community, I strongly believe in the importance of giving back. My family and I have participated in cancer walks and other volunteer activities throughout the Syracuse, New York area. May 2012 – Syracuse Chamber of Commerce (CenterState CEO) Ambassadors congratulate three members of ‘CNY Care Connection’ for their accomplishments: CNY Elderplanning celebrated its first anniversary; A2Z Home Medical Supplies has been at its new location for one year, 430 South Main Street, North Syracuse; and Theresa Cangemi, of Medicare Made Simple, also received a certificate for recently earning her CSA designation. 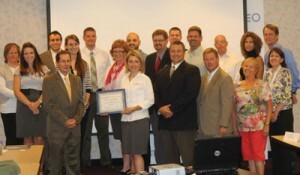 One of the ways I give back to other businesses here in the Syracuse area is through the CenterState CEO Ambassadors. When I became a member of the Chamber in 2009, I found that becoming an ambassador was a great way to get to know other chamber members, get involved in the chamber events, and learn about the other businesses in my community. I enjoy welcoming new CenterState CEO members and providing recognition to member and non-member businesses who are celebrating important milestones. CenterState CEO Focuses on working collaboratively to spotlight regional strengths, grow strategic industries, and encourage investments and innovation to achieve success as a region. Liverpool Chamber of Commerce, Inc. strives to enhance the quality of life in the greater Liverpool area through the development and perpetuation of programs for businesses, along with community involvement and events. CNY Care Connection is a group of dedicated local companies and professionals committed to providing the best, most comprehensive service offerings designed to allow the elderly and the disabled to live independently at home. A referral to community services group. (J. R. Pickard & Associates is no longer operating as a business). WBOC (Women Business Opportunities Connections) is the premier organization in CNY for women in business that focuses on supporting and advancing the success of women entrepreneurs. Women TIES is an organization helping women entrepreneurs promote and expand their regional marketplace.